GOLDEN, COLORADO – Foothills Art Center proudly presents Variations on Growth: Ben Butler. The exhibition kicks off with a member-only preview on Thursday, May 11, 2016 from 6:00-8:00 p.m. The exhibit opens to the public on May 12th and will be on view through June 25th. 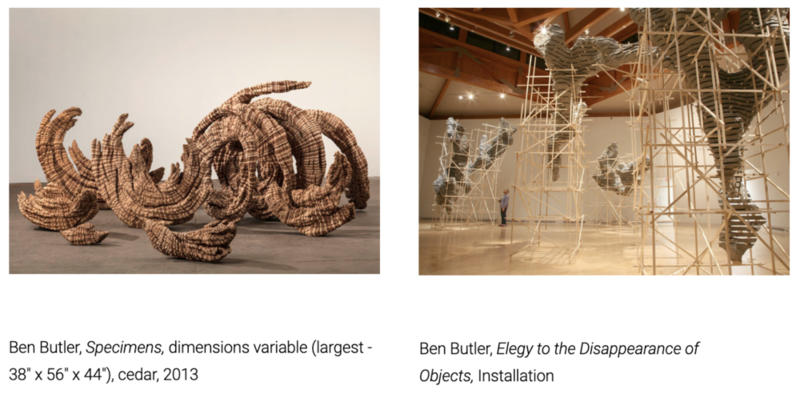 With a discussion with the artist on Friday, May 12th from 5:00 – 6:00 p.m.
Variations on Growth: Ben Butler is generously sponsored by Linda and Terry Stevinson. Ben Butler received his Master of Fine Art from the School of the Art Institute of Chicago in Sculpture, and his BA from Bowdin College in Visual Arts. His work has been exhibited in solo shows in New York at Coleman Burke Gallery and Plane Space, as well as Zg Gallery in Chicago among other galleries across the United States. He is the recipient of a Pollock- Kranser Foundation Individual Artist Grant and numerous fellowships and residencies. Ben Butler is a prolific artist, with a unique organic style. Largely process driven, he and his assistants work fluidly as they allow the procedure of cutting wood and foam into organic shapes and molds to inform the final product. The outcome is surprising and awesome in both scale and intricacy. He constructs massive installations from wood, foam and concrete. This show displays a wide variety of his work including outdoor installations, extremely large room-sized unique constructions and some new pieces never before seen. Gallery hours are Monday – Saturdays: 10:00 a.m. – 5:00 p.m., Sundays: 12:00 – 5:00 p.m. To learn more visit www.foothillsartcenter.org, or call us at 303-279-3922.